IN WHAT MOST definitely is one of the most unusual if not embarrassing admissions by a senior politician, the British deputy prime minister Nick Clegg has admitted he owns a onesie. 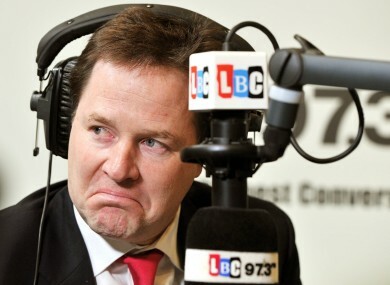 During a unique radio phone-in show on LBC radio in London earlier today Clegg was asked whether he owned the all-in-one garment that is generally reserved for wearing while relaxing on the couch. It has since transpired that the caller who asked the question is an old party activist in Sheffield (Clegg’s constituency) Harry Matthews who was apparently once tipped as a future Prime Minister. Email “Video: British deputy prime minister Nick Clegg admits he owns a onesie ”. Feedback on “Video: British deputy prime minister Nick Clegg admits he owns a onesie ”.